Skip pretty much has a spot guaranteed on this list. He loves him some Brett Favre, but we don't understand where the Aaron Rodgers hate stems from. 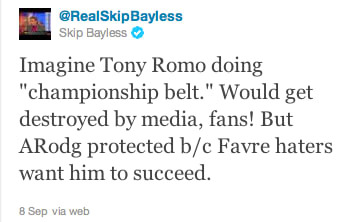 Romo will never get away with it because he chokes and is overrated. #HOP word to Prime.